3D Browsing is about emerging yourself into 3D Environments and 3D Games where the virtual 3D Buildings are REAL businesses, organizations, online stores, museums, amusement parks, online schools, houses, social media, and more. It is designed to be distributed, web-based, worldwide, 3D Gaming environment for everyone; the third generation of the Internet! Using our 3D Content Management System (3D CMS) website software, which we plan to release as open-source, 3D Web sites can be hosted anywhere on the Internet. Picture walking down a street in a 3D Game environment with smooth, continuous, interactive animation and each 3D Building you pass hosted in different parts of the world. 3D Buildings load as you approach and unload as you walk away. That is 3D Browsing! The 3D Buildings are individual websites. On the back-end, they are called, retrieved, and transferred like traditional web pages. The difference is that we keep an interactive 3D Game window (the 3D Scene) open and alive, while we hot-swap (add and remove) parts of 3D Buildings and scenes. It is so simple to use that we taught a 2-year-old 3D Browsing in just seconds. You can use your mouse, keyboard, or touchscreen and it works on computers, laptops, and mobile devices. 3D Browsing is for everyone to enjoy! Most importantly, we have simplified the mass production, distribution, hosting, creation, and maintenance of 3D Websites with our 3D CMS. * 3D Communities – Hosted anywhere on the Internet, these are the entry points for 3D Browsing. 3D Communities are the 3D Scene and map for the 3D Building locations. * 3D Buildings – Hosted anywhere on the Internet. They are designed to be created and maintained in one place and can be added to many 3D Communities anywhere in the world. Finally, we added interactive 3D versions of web components like form fields, scroll-able wall segments, buttons, TV-like video screens, switches, store product displays, link buttons that open traditional web pages in iframes or new browser tabs, and so much more. 3D Browsing is not trying to replace traditional websites, but enhance the user experience while embracing new ways to explore and find traditional web pages. We see large virtual cities, malls, and social communities for 3D Browsing and exploration in our very near future! What problems does HTTP3D Inc solve? For over 25 years, Internet browsing has been defined by web pages with multimedia, pictures, text, and links. You open a web page like reading a newspaper, search, scroll down, click on a link, wait for a new page to load, then read and repeat. In that same time, we now see the evolution of 3D products like 3D Printers, 3D Movies, 3D Televisions, 3D Games, 3D Artwork, 3D Object Modeling, and 3D Virtual Reality. There are well over 700 million people worldwide playing online video games. Programmers added interactive games that are bound to operating from a single web page. It is time for browsing to evolve. It came to me in a dream. I invented 3D Browsing and have been blazing a trail ever since. In addition, we established 3D Building businesses in 3D Game environments instead of having to advertise with banner ads! This will become a whole new category to market your business and products! 3D Browsing is for everyone to enjoy. * 3D Building Stores are marketed to businesses with online store websites. * 3D Buildings are for everyone that have websites. 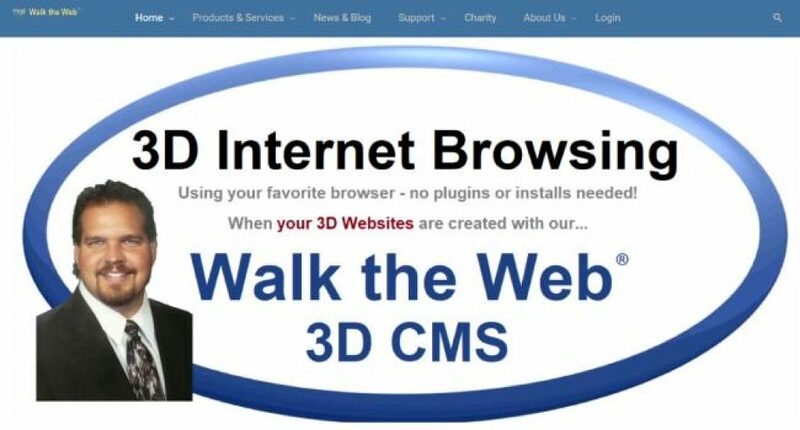 Everyone can use our 3D CMS website for free at https://3d.walktheweb.com to create and host 3D Websites. We have tutorials, downloadable templates, documentation, and videos. We offer paid services such as create custom 3D Web sites, premium upgrades, link your custom domain name http://3d.YourDomainName.com, SSL Certificates for secure 3D Browsing, and service/support agreements. We have already taken the concept of 3D Browsing farther than anyone and blazing a new trail as we go. Henry Ford did not invent the automobile, but he invented the assembly line to make it easy for anyone to own the car. As a corporation, January 2018 was a defining month when our US Patent for 3D Browsing was issued! (serial# 9,940,404). It is also pending in United Kingdom, India, Canada, and Mexico. In 2016, the founder, Dr. Aaron Dishno, taught a class in 3D Browsing at La Sierra University! In 2014 was the first public release of our working 3D Browsing software. We want to distribute a free open-source version of our 3D CMS while hosting our instance at https://3d.walktheweb.com for all to use. Our goal is to become the WordPress for 3D CMS and 3D Websites. * 3D Architects who are people that are efficient in all aspects of our 3D CMS. * 3D Developers who are 3D Architects that are also efficient in creating custom code Plugins that add functionality to our 3D CMS. Graduated in 2011 from La Sierra University in Riverside California, I received my Doctorate in Education (Ed.D.) with an emphasis on Administration and Leadership. In addition from California Baptist University, I have a Master of Science Degree in Education with an emphasis in Technology and a Bachelor of Science Degree in Information Services Management. I held the position of Webmaster and Programmer Analyst III for over 11 years for the largest county in the USA, San Bernardino County. I have worked as a computer programmer for high-visibility / high-traffic websites, mentor, teacher, analyst, electronic repair, network consultant/installer, systems/server integrator, enterprise architect, computer store owner, and cloud architect for an accumulative 25 years. I am an inventor, problem solver, artist, painter, architect, sailor, and musician. Aaron’s wife Karen was a Special Education Teacher for Riverside Unified School District (RUSD), for over 20 years. Karen has a Master of Arts Degree in Education with an emphasis in Special Education and Bachelor of Arts Degree in Liberal Arts, both from California Baptist University, and California Teaching Credentials for K-12 Multi-Subject, Mild-Moderate Special Education, Autism Spectrum Certified, CLAD, and Administrative Credentials. Karen plays a major role in human resources, editorial, social media, training, online school, curriculum development, student counselor, program advisor, budgeting, planning, and corporate secretary. Karen is a caring individual, patient, supportive, painter, sailor, musician, and has brilliant skills as an editor. Industry: 3D Browsing, 3D CMS, 3D Website Design, and Hosting. OK, I have to say it, I love my idea and where I am heading with it. You should know that the products will develop. I have one that lets you add a 3D Store to your online store in just 5 minutes that does not require any additional maintenance. It pulls your products and uses your Shopping Cart already in WordPress. You take care of your store in one place, yet add it to many 3D Communities, which are 3D Game scenes! As we build games and entertainment, this new way to advertise your business will be awesome! I have faith in my own company, or I wouldn’t be here! + PROS: Where we are heading is awesome with so many possibilities! - CONS: The program takes time to perfect it. As we get closer, it will grow exponentially!